My bladder demands an apology, and if this keeps up, my chair will be asking as well. Yes. Didn’t you see it the report? I know we’re spending a lot of time on this. Yes, it’ decided. But let’s brainstorm anyway. I feel like Moe hit Larry with Curly’s frying pan.Unless meetings have the elements of respect, relevance and intentionality, there will be frustration, confusion, and inertia. Respect A true educator is truly busy. With class prep, didactic design, classroom teaching, homework and grading, student consultations, and Meee-tings (sing it now: “Ohhh, how I love Meeee-tings”) Christian educators have a lot on their plate. Many work at the national level with the top leaders in their countries…in meetings! Busy people with heavy responsibilities deserve respect for their time, energy, and money that go into the hours dedicated to meetings. Early in our ministry, Monita and I worked at Summit Church in St. Paul, Minnesota. Our congregation had inventors, engineers and professionals who worked at the International Research and Development Center for 3M. They told me that meetings called at the R&D had to have a clear purpose, information had to be clearly communicated before a meeting, and a set time was allocated. In addition, each meeting had a calculated cost that included the hourly wage paid to each person in the meeting, the use of facilities and resources provided to the participants. 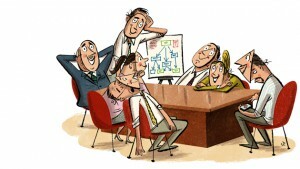 Today an average engineering meeting can easily cost $10,000! When we call a meeting, it’s important to recognize that our people are also “top gamers”. We must respect the valuable time, money and human resource each player brings to the table. Information provided in anticipation of a meeting should be clear, concise, and comprehendible. Our people deserve it. In the case of international gatherings, I have often sat in a room and calculated the mere costs of being there. Flights, hotels, meals, and transportation are big factors. But salaries, the number of days involved, human energies and the transfer of valuable information is also part of the equation of a good meeting. Understanding the tremendous investment by our supporters and colleagues to be at a meeting is sufficient motivation to make sure the time really matters. Relevance One of the biggest complaints any of us will ever hear about a meeting is its irrelevance. When the agenda is overloaded with protocol, and time is wasted on reading extensive reports from who knows when or why, things can go south very quickly. Set an aggressive agenda for your meeting. Move with the flow. Energize, recognize, appreciate, and invite participation. Take care of the prerequisites in a timely and expeditious manner. Recognize that the opening time period of a meeting is when enthusiasm is at its highest. That’s when creative energies are bustling and people want to be part of the action. It’s best to set an agenda that capitalizes the important stuff upfront. Intentionality A good meeting needs to drive toward a focused conclusion. As each item of the agenda unfolds, be sure to find a way to capsulate the findings or recruit energies for further work. God Himself set a concise agenda when he called a meeting for Israel in Isaiah 1:18 “Come now, let us settle the matter,” says the LORD. There are two words I really like concerning meetings: intentional and proactive. We need intentionality related to why we have come together. What is it we have discovered? Is there a clear direction that can be established to tackle a problem or implement a new and meaningful process? Will participants walk away from your meeting energized and with clearer vision and understanding of the task? It’s important to plan for getting desired outcomes with any meeting. There may not be simple answers. But clearly there needs to be a focused, intentional effort made by the leader of a meeting to sort through the issues and articulate possible options. Get people on the same page, or they’ll work from different play books. Don’t forget to PRAY! Invite people in your meeting to get up, call on the Lord, and ask for Divine Intervention in the meeting. Take a couple of moments for intercession at a key time. Invite the Holy Spirit to come in. Be intentional and inclusive. More will be accomplished in a meeting that has a dimension of prayer attached to it than any other technique or dynamic. Excellent recommendations. I can’t count the number of meetings we have attended and planned over the years. My greatest take-away has always been the fellowship with like-minded participants. Perhaps more Respect, Relevance and Intentionality for each would have left me singing as well as Mike. Great article! & Great advice! Great insight, Mike! “It’s best to set an agenda that capitalizes the important stuff upfront.” So true! How many times have I left the most important for last and with half the committee. Hmmm. And I love this line, “More will be accomplished in a meeting that has a dimension of prayer attached to it than any other technique or dynamic.” Great article! Excellent article! Great use of narrative to make strategic planning seem entertaining. I can vouch for what Mike is saying here. I have seen his face shift through all the colors in the rainbow in some meetings that could grind boulders into sand. Thank you, Mike for such an amusing, but important message. See you in the meeting. Hey,Mike. Good article but what suggestions do you have for getting preliminaries out of the way? Like to remind folks of what was decided before or talked about before? Just wondering. I do want to chair better meetings so any suggestions like in this article are greatly appreciated.